We’d love your help. Let us know what’s wrong with this preview of Silver Wedding by Maeve Binchy. Desmond and Deirdre Doyle will have been married for twenty-five years in October. It falls to the Doyles' eldest daughter, Anna, to decide how best to commemorate her parents' Silver Wedding. No use asking her sister Helen, living in her London convent, or her brother Brendan, who has chosen another form of exile on a bleak farm in the West of Ireland. But it is unthinkabl Desmond and Deirdre Doyle will have been married for twenty-five years in October. It falls to the Doyles' eldest daughter, Anna, to decide how best to commemorate her parents' Silver Wedding. No use asking her sister Helen, living in her London convent, or her brother Brendan, who has chosen another form of exile on a bleak farm in the West of Ireland. To ask other readers questions about Silver Wedding, please sign up. This is perhaps a strange question to ask, but did anyone but me find the descriptions of people in their thirties and forties as "old" in this a bit off-putting? One of the nuns in the stories talks about being 34 and how ancient that is. And then a character wants to adopt a baby, but he's too old at 46. I realize that attitudes were in 1985, the year in which the book was set, but I find it annoying nonetheless. Not an author I have ever ever read much from. It is lighter fiction than I normally read but a friend whose reading opinions I respect is very fond of this author and so I thought I would give it a go. Initially, I did find it very patchy reading I found the first main character, Anna difficult to bond with, because she was so very emotionally awkward and repressed, she redeemed herself tidily however and I became quite fond of her as well as several other characters. One of my favourite charac Not an author I have ever ever read much from. It is lighter fiction than I normally read but a friend whose reading opinions I respect is very fond of this author and so I thought I would give it a go. Initially, I did find it very patchy reading I found the first main character, Anna difficult to bond with, because she was so very emotionally awkward and repressed, she redeemed herself tidily however and I became quite fond of her as well as several other characters. One of my favourite characters/stories was that of Brenden, Anna's brother and my absolute least favourite was Helen, their train wreck of a sister. I found Helen to be entirely unconvincing and her back story did nothing to redeem the situation. Reading her I just could not believe no one had ever taken her in for psychiatric assessment. Eventually, I had to skip most of her story because I disliked reading it so much, however, that did not in any way make the story difficult to follow, so that was ok. 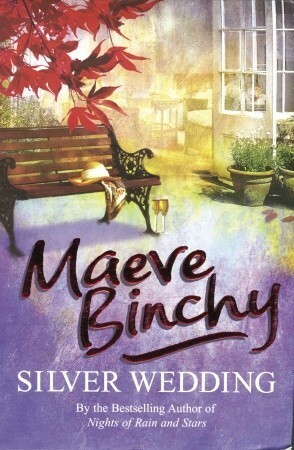 This was a classic Maeve Binchy - a story told from several people’s viewpoints. It was a rather sad story of a celebration of a 25th wedding anniversary culminating after revelations of years of secrets and ensuing unhappiness - between friends, between parents and children, between siblings, between husbands and wives. Each chapter focuses on a different character, with the last chapter bringing them all together for a silver wedding anniversary celebration. It was almost more like a series of related short stories than one novel. I love a good character story, and in that Binchy definitely delivered. Silver Wedding follows the silver wedding anniversary of Deirdre and Desmond Doyle. All of the characters in this story are linked to them some way. I liked some of the characters and despised others. And the ending did not really work, you have to pretty much just guess what is going to come next. The book is broken up looking at Deirdre and Desmond's three children (Anna, Brendan and Helen). Then we go into Desmond. After him we follow Father Hurley (he married Desmond and Deirdre). Then we fo Silver Wedding follows the silver wedding anniversary of Deirdre and Desmond Doyle. All of the characters in this story are linked to them some way. I liked some of the characters and despised others. And the ending did not really work, you have to pretty much just guess what is going to come next. The book is broken up looking at Deirdre and Desmond's three children (Anna, Brendan and Helen). Then we go into Desmond. After him we follow Father Hurley (he married Desmond and Deirdre). Then we follow Maureen and Frank (maid of honor and best man at Desmond and Deirdre's wedding) and finally Deirdre. The last portion is on the silver wedding celebration itself. So my favorite character chapters were definitely Anna, Desmond, Father Hurley, and Maureen. Anna is the eldest of the children and you get to read about her romance that is not everything she hopes it to be. But a chance ride with a long time customer she knows opens her eyes to her parents and to her own relationship. A few times I was surprised by things Anna was hiding from her parents, but this book takes place during the 1980s, so I had to recall a few times that things today would not be acceptable to people back then. Desmond we get to see how tired he is by what his life has become. He works at a store that his best friend runs (Frank) and realizes that he is going to keep getting shuffled around and is trying to figure out what his dream is. He's a really good guy, and when you read the parts with Deirdre you wonder at how they work as a husband/wife. Father Hurley we find out is puzzled about being asked to be there to officiate between Desmond and Deirdre, and even hints at knowing why the two of them had a rushed wedding (rhymes with wegancy). But he is pretty content and happy with his family and his nephew Gregory. But this whole chapter was a cautionary tale against staying silent when you know someone has done something wrong. I really did want to follow up with Father Hurley and see what happened to him and his family. Maureen is a successful business woman who has the wind knocked out of her when she realizes her mother who she has long admired, was not who she thought she was. I didn't really care for Maureen when we get to the silvery wedding portion because she seemed hell-bent on trying to tempt Frank away from his wife. We find out these two used to date, but Maureen dumped him due to her mother's influence. I felt sort of meh towards Brendan's whole story-line. You find out he is pretty selfish and seems to think less of his family for trying to hide things from others. I guess because I grew up in a family like that, ie you keep family business to family, don't go out running your mouth, I thought his dislike of his family was not that intriguing. Helen's story-line was infuriating and sad at the same time. You realize that her running away to join a convent was due to an incident that occurred between her and her father's best friend Frank. Helen keeps messing up every step of the way and you realize why a nun would be tempted to smother her when you read about all of her messes she keeps getting into. I despised Frank's whole story-line. Finding out what kind of man he is just made me ill, I think that Binchy tried to paint him as some noble guy, but based on the silver wedding chapter we know that he is going to get up to something that will involve Helen that I am sure is going to end poorly. Deirdre you quickly find out is so worried about what others think she has become paralyzed by it. After meeting up with her widowed mother she has her eyes opened about her long held beliefs about people. But you realize that Deirdre felt and still feels forced to pretend to be happy even when she's not. Usually Binchy is better at tying things up, but a lot of things are left at loose ends when the book finishes. I can imagine though that some people Anna and Desmond are going to be happy in the future based on decisions that they made. The characters of this story all put forth one view of their lives to others around them ... as you read each chapter based on a different character, you find out the real story. In the end you get the feeling that many of them are beginning to realize that "projecting the right image" isn't as important as living a life you can be happy with and in. Just ok, not her best work. most of the characters not very likable, started out well but grew more boring toward the end. I was not invested enough to care what happened anyway. People absolutely fascinate me; that's one reason I love my work as a vocational rehabilitation counselor. And it's not just their stories which interest me, though that's part of it. It's also the small things we do that set us apart. I love it when I know a friend so well that I can tell in advance what will make him laugh or how she will react in a given situation. As I read Maeve Binchy's "silver Wedding," I found myself thinking that what sets her writing apart is exactly this: her characte People absolutely fascinate me; that's one reason I love my work as a vocational rehabilitation counselor. And it's not just their stories which interest me, though that's part of it. It's also the small things we do that set us apart. I love it when I know a friend so well that I can tell in advance what will make him laugh or how she will react in a given situation. As I read Maeve Binchy's "silver Wedding," I found myself thinking that what sets her writing apart is exactly this: her characters are so complete that we come to know those little things that set them apart from all the rest. And therein lies the fascination. Summarizing the plot won't really provide the motivation for you to choose this book. Basically, the framework of the novel is that a couple is celebrating their 25th anniversary and a big party is planned. Each chapter focuses on a different person who will attend the party: the couple's three children, the maid of honor, the best man, and the priest who said the wedding. The final chapter deals with the celebration itself. Now I know that doesn't sound like much. But let me assure you: this is a book you won't soon forget. Its strength is not in its plot; rather, it stems from Binchy's incredible ability to portray this family and their close friends. We see how certain beliefs and practices shape each of the people we meet. This is a family where image is viewed as extremely important and where certain events are considered "off limits" to the world. And we see how that plays out in each of their lives. We also see how outsiders,, such as the priest and the friends, impact those roles. I'm not doing the best job of reviewing this one, I know. Suffice it to say that if you care about what makes people tick, if you long to understand yourself and those around you just a bit better, then you owe it to yourself to pick up this gem of a book. It's definitely one of Binchy's best. And, given the quality of her work, that's really saying something. Desmond and Deirdre Doyle are approaching their Silver wedding anniversary. Anna, their oldest, believes that there needs to be a big party to celebrate the occasion - but knows she'll be the one to do all the work to plan it. Helen is living in a convent and Brendan is on a farm off in the wilds of Ireland. Also invited are Maureen Barry, who had been Maid of Honor, Frank Quigley who was Best Man and Father James Hurley who had been the officiating priest. It seems everyone has secrets that mu Desmond and Deirdre Doyle are approaching their Silver wedding anniversary. Anna, their oldest, believes that there needs to be a big party to celebrate the occasion - but knows she'll be the one to do all the work to plan it. Helen is living in a convent and Brendan is on a farm off in the wilds of Ireland. Also invited are Maureen Barry, who had been Maid of Honor, Frank Quigley who was Best Man and Father James Hurley who had been the officiating priest. It seems everyone has secrets that must be kept from the others for the sake of keeping up appearances. Will they all show up on the special day? Talk about disfunctional family! Yet I find myself also thinking Typical Binchy. Unlike the other books of hers I've read, this one is set in England instead of Ireland. In this one, each character has a chapter which develops their past and the receipt of the invitation to the party. The book ends with the final chapter being the party. I wasn't sure what to expect with the party, but was satisifed with the way it all pulled together. Maeve Binchy writes of people whose lives would never touch mine. I can't decide if her writing is old-fashioned or maybe it's the topics she picks to write about. And yet, her characters have problems that I can relate to, some of them from a distance. And I can't stop reading, so eager to know how it all turns out. In this book, people have been living lives of lies -- don't we all? -- and it all comes to a head when the silver wedding anniversary of a couple with three children is coming up. I Maeve Binchy writes of people whose lives would never touch mine. I can't decide if her writing is old-fashioned or maybe it's the topics she picks to write about. And yet, her characters have problems that I can relate to, some of them from a distance. And I can't stop reading, so eager to know how it all turns out. I do just adore the way that Maeve Binchy can pick you up and envelop you into the lives of a bunch of people who are doing nothing except organising a 25th wedding anniversary, but in the most compulsive fashion! Marvel Binchy has a strange way of writing. Silver Wedding is about the Silver Wedding of Deidre and Desmond Doyle. She writes in the point of view of her three children Anna, Helen and Brandon. The priest who married them. Desmond Doyle's best friend Frank who he travelled to England with from Ireland and Deidres best friend I would categorise this book as a satire. The characters are all friends and family of the Doyle's. The book was well written but it got a bit boring. It wasn't a book I woul Marvel Binchy has a strange way of writing. Silver Wedding is about the Silver Wedding of Deidre and Desmond Doyle. She writes in the point of view of her three children Anna, Helen and Brandon. The priest who married them. Desmond Doyle's best friend Frank who he travelled to England with from Ireland and Deidres best friend I would categorise this book as a satire. The book was well written but it got a bit boring. It wasn't a book I would pick up and not be able to put down, I enjoyed it but I know Marge Binchy has written better. Written from each individuals point of view. Enlightening. Had a few good chuckles to tell Shanna about. She's one of my few quirky authors! A silver anniversary is always an occasion to celebrate, and for Desmond and Deirdre Doyle this celebration is no less special. As the Doyles prepare to commemorate the twenty-five years of marriage they have shared, their closest family and friends gather around them in remembrance of such a happy time. However, it is also a time fraught with tremendous uncertainty. The Doyles face an uneasy moment of reckoning as their friends and family members begin to arrive for the festivities. So much time A silver anniversary is always an occasion to celebrate, and for Desmond and Deirdre Doyle this celebration is no less special. As the Doyles prepare to commemorate the twenty-five years of marriage they have shared, their closest family and friends gather around them in remembrance of such a happy time. However, it is also a time fraught with tremendous uncertainty. The Doyles face an uneasy moment of reckoning as their friends and family members begin to arrive for the festivities. So much time has passed for all of them, and so much has changed. The couple may have prepared themselves for anything; but they can only hope that everyone has come ready to celebrate their twenty-fifth wedding anniversary. Everyone has certainly come to congratulate the happy couple, but each person seems to have also brought their own personal baggage to the party. First to arrive are the three Doyle children: Anna, Helen, and Brendan. Their hapless daughter Helen is still struggling with her vocation to become a nun. Having reached a crossroads in her life, she plans on making her final decision at her parents silver anniversary. Their rebellious son Brendan prefers a life of solitude spent on the family farmstead in Ireland, rather than living with his parents and sisters in London. Desmond's best man - Frank Quigley - was once his very best friend, but is now Desmond's boss. Deirdre's bridesmaid - Maureen Barry - is now a successful career woman, looking forward to opening a London location in her chain of fashion boutiques. Father James Hurley - the priest who married the couple - arrives to the silver anniversary carrying his own guilty family secret. Yet it is her parents silver anniversary that will prove to be a time of ultimate transformation for the Doyles' eldest daughter, Anna. She is the person tasked with the seemingly impossible: navigating through the troubled waters of the past and smoothing out ruffled relationships. For only Anna can confront their tarnished lives and find a truth strong enough to draw them into a circle of love that might nourish, protect, and finally heal them all. I just got so bored by the characters, especially Anna, she’s overtly awkward. What’s wrong Maeve? I saved this book from the bin anyways, nothing to complain in retrospect. Like all Binchy's books, or at least all of them that I've read, this one is steeped in the emotions -- the blessing and the curse -- of friendship and family. The intertwined stories of Desmond and Deirdre Doyle, their three children, the man and woman who were best man and maid of honor at their wedding, and the priest who married them each illustrate different aspects of love and loss, and the lengths to which we go to preserve the happiness of those we love, even when we get it wrong. As a s Like all Binchy's books, or at least all of them that I've read, this one is steeped in the emotions -- the blessing and the curse -- of friendship and family. The intertwined stories of Desmond and Deirdre Doyle, their three children, the man and woman who were best man and maid of honor at their wedding, and the priest who married them each illustrate different aspects of love and loss, and the lengths to which we go to preserve the happiness of those we love, even when we get it wrong. This was an OK Binchy book. It wasn't as good as Scarlet Feather, Quentin's, Circle of Friends, The Copper Beech, or Night Class! Not nearly. However it was better than Firefly Summer (my most loathed of Binchy's books), or Light A Penny Candle. Obviously not a favorite, but it's alright. This is one of her more depressing books, although I thought it ended happily on the whole, and for what this author is capable of. Though bits are quite sad, there are some good life lessons to be learned. As This was an OK Binchy book. It wasn't as good as Scarlet Feather, Quentin's, Circle of Friends, The Copper Beech, or Night Class! Not nearly. However it was better than Firefly Summer (my most loathed of Binchy's books), or Light A Penny Candle. Obviously not a favorite, but it's alright. As always the author does a lovely job of portraying her characters, endearing them to her readers and making them real and relatable. Each chapter, each story told from a different voice is unique yet entwined with all the others; classic, trademark Mauve Binchy. Deirdre and Desmond are planning their Silver Wedding Anniversary party. Appearances have always been extremely important to Deirdre so she strives to have everything perfect. The first eight chapters of the book are told my different members of either the family or the wedding party. It all feels like a series of vignettes even though they are tied in at the end. The last chapter is about the party itself. I am not a fan of Maeve Binchy, but someone in my book group requested a book by her so I Deirdre and Desmond are planning their Silver Wedding Anniversary party. Appearances have always been extremely important to Deirdre so she strives to have everything perfect. The first eight chapters of the book are told my different members of either the family or the wedding party. It all feels like a series of vignettes even though they are tied in at the end. The last chapter is about the party itself. This is on of those rare books I was quite happy to be finally done with. Normally I sympathize with the characters and wish them well.. in this case, however, most of them were behaving so stupidly and were so irritating, that I'd gladly erase them myself from the surface of the fictional world :) Whenever another disaster was to fall upon another hopeless example of how not to live one's life, I was about to shout "Serves you right!". Honestly, just how boring and irritating a book can be?? Maeve Binchy has a way with words. She is a natural story teller. Here we have a seemingly ordinary family coming together to celebrate a Silver Wedding in "darkest" Pinner. Each character is introduced in a separate chapter and we find with each a fascinating story of how they view life and some of the life changing incidents they experienced. The writer scratches beneath the veneer of middle class respectability to find some dark secrets and hypocrisy. Deirdre and Desmond were ready to celebrate their 25th wedding anniversary with a party. They had three children, all different from one another. Many characters were followed throughout the story. And each had a hidden event secret! In the end, will love prevail? This was an easy to follow book with many interesting characters. Don't give any stars because it doesn't deserve even one single star. Finished it to see what makes it such a popular book. I'm sorry for the time I spent. Throw it to the recycle bin so that no one can read it via me. Just terrible! Not much to say. A simple story; an easy read. I love her style. Her characters are so rich. While I have enjoyed a number of Binchy's books, this one was just annoying. I couldn't get behind any character, the story just trudged on and finally ended. Typical early Maeve Binchy. Each character had a chapter and the final chapter brought most of them together. Perception and lack of communication recurrent themes. She studied at University College Dublin and was a teacher for a while. She also loved travelin Maeve Binchy was born on 28 May 1940 in Dalkey, County Dublin, Ireland, the eldest child of four. Her parents were very positive and provided her with a happy childhood. Although she described herself as an overweight child, her parents' attitude gave her the confidence to accept herself for who she was.